Keurig K70 vs K75 | What's Best for you? » Keurig K70 vs. Keurig K75, What’s Best for you? We’ve all had those mornings. Your alarm didn’t go off and you overslept; your kid spilled his orange juice all over the floor and then painted his magnum opus with it on the cabinets; the shirt you were going to wear has a stain on the pocket and you have to change – and at the end of it you walk out the door, sans coffee. Best case resolution, you have time to grab a cup on your way into work; worst case, you just don’t get your coffee fix at all. While neither the Keurig K70 or K75 will wake you up, babysit your child, or do your laundry, they can make getting your morning brew an easily accomplishable goal. As opposed to traditional coffee makers that take a little more work to set up and longer to brew, with the K70 and K75 all you have to do is posip a K-Cup pod into the machine, press a few buttons, and head out the door. The Final Shot: Unless you are dead set of having the water filter come with the machine at your time of purchase, the K70 is the better pick. It is priced a little lower than the K75 and has almost all the same features aside from the water filter. If you’re reading this on a Monday, and especially if you’re reading this without your coffee, you may already be sold. But keep reading and we’ll give you a full report on the two machines so you can make an informed choice about the machine that will be perfect for you. The Keurig K70 and the Keurig K75 are both welcome members of the ever-growing Keurig family. 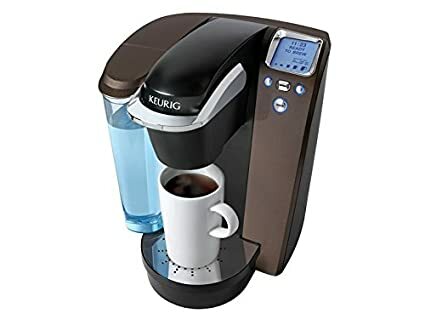 As you would expect from a Keurig brewing machine, both products quickly brew single cups of coffee using either K-Cup pods or their equivalent or a refillable K-Cup pod that you stuff with your own coffee grounds. In signature Keurig fashion simply insert the pod, pick your brew size, and in less than a minute your cup of perfectly tailored coffee is steaming and ready to go. In terms of the Keurig line, both the K70 and K75 are very standard options. Keurig has ventured into smaller models for users with relatively low coffee demands and larger units for frequent use or corporate settings. The K70 and K75 sit comfortably in the middle of these two extremes, offering just the right capacity and set of features to accommodate most households. The K70 and the K75 each offer a total of 5 different brewing size options: 4 ounces, 6 ounces, 8 ounces, 10 ounces, and 12 ounces. The goal of offering different brewing sizes is to accommodate your particular drinking needs. Although each brew only uses 1 K-Cup pod, the brew size you select will deliver a stronger or weaker brew. As a side note, if you’re looking to fill up a travel mug, while both machines can accommodate the size of most mugs, to get it really full, then you’ll probably need to run more than one brew cycle. Each machine also includes an ample 72-ounce water reservoir backlit by a blue LED light and an LED lit display for selecting your brew size. The machines also include an auto on/off feature so that you don’t waste unnecessary energy when you’re not using the machine, an adjustable temperature control, and a favorite setting for you to preselect the cup size that you use most frequently. And unlike some models that only accept K-Cup certified pods, the K70 and K75 can both brew using K-Cup pods or refillable pods that you pack with your own favorite coffee. The Keurig K70 and Keurig K75 are ultimately very similar machines. They both fit nicely into Keurig’s line of products as quality, standard options that could replace your traditional coffee pot and accommodate most people’s lifestyles. But if you’re looking to purchase your next Keurig and you want to make sure you pick the machine that is going to be just the right fit for you, then there may be a few differences you should keep in mind. When it comes to size, the Keurig K70 and Keurig K75 are relatively similar, but sport a few differences. Both machines feature the well-known Keurig design. The water reservoir backlit by a blue LED light sits on the right side of the machine and on the left the panel slopes upward with the display panel situated just above the four different brew buttons. The metal grate under the brew spout can be removed to accommodate larger cups such as travel mugs. Both machines also come in three different color choices: black, mocha brown, and silver. The biggest design difference between these two machines is that the K70 is a bit bulkier than the K75 weighing in at 13.8 pounds compared to the K75’s 12. The dimensions of the two machines are similar so they’ll take up about the same amount of counter space in your kitchen or office, but the K70 is a little heavier. While the bulkier size could be a problem for some people, Keurigs generally aren’t branded as portable machines. As long as you plan to leave your machine in the same place, then the size differences shouldn’t be much of an issue. But if you’re planning on using your Keurig as part of a traveling enterprise, then maybe give size a second thought. The controls on both the K70 and the K75 are relatively similar. Each features a standard 5 brew size options that also changes the strength of your joe. You can use the favorite feature to pre-select the size you prefer which makes brewing your daily cup even easier. The machines also feature a blue LED display and programmable clock that displays on the screen when the machine is not actively brewing. Keurig has revolutionized the single cup brewing system, and the K70 and K75 are flagship examples of why the brand is loved so much. In addition to having great features like brew size options and a customizable favorite, the K70 also includes a quiet brew feature. While a coffee pot may not be thought of as a traditionally noisy appliance, the quiet brew feature does ensure that brewing your coffee contributes to the pleasant ambiance of a quiet morning instead of disrupting it. Additionally, the K70 also brews your cup in less than one minute and can quickly reheat for another brew in case someone else in your household needs a quick cup, or if you’re just looking for a refill. The K70 and K75 also feature an adjustable temperature control. While the feature is nice, it’s not so customizable that you could use the Keurig to open your own craft brew café. Ultimately the Keurig K70 and K75 can heat a drink up to about 190 degrees Fahrenheit; that’s plenty hot for you to enjoy your cup of coffee or hot tea, but not quite boiling. Keurigs are all about simplicity. No grounds, no filters, and basically no mess or clean up. But the machines do require occasional maintenance in order to keep them running smoothly for a prolonged period of time. Some of the additional items that come with the K70 and K75 can help get you started with your Keurig and keep you brewing for years to come. The K70 is a pretty standard package. While you can add a water filter to improve the taste of your coffee and increase the longevity of the system’s performance, it doesn’t come with a water filter. The needle on the Keurig K70 can also get gummy and clogged over time and will have to be cleaned if you want consistent use. You can find instructions in the manual for cleaning the needle and you can purchase kits to make this process easier, but again, the K70 doesn’t come with any of the equipment you’ll need. When you purchase the Keurig K70, you get a standard model single cup brewing system, and up front, that’s about it. The K75 comes with a few more bonuses. Like the K70, the K75 will need to be cleaned occasionally to keep the machine in tip top shape over a long period of time. Using filtered water will decrease the number of cleans you need to perform, and can help the machine last longer. Luckily, the K75 actually comes with a water filtration kit. This kit not only keeps your water clean but will also help you gauge when the filter should be changed and when the machine should be serviced. Like the K75, you’ll need to clean the needle occasionally either with the instructions in the manual or with a cleaning kit. When you’re looking for a single cup brewing system to replace your old coffee maker, a Keurig is definitely a solid choice. Both the K70 and K75 are standard Keurig models that offer all of the features everyone loves about Keurigs at a reasonable price. Ultimately our pick out of the two is the K70. The K70 and the K75 are very similar machines, but it’s the lower price tag of the K70 that makes it a winning choice in our book. Whether you go with the K70 or with the K75 you’ll be getting a quality machine. 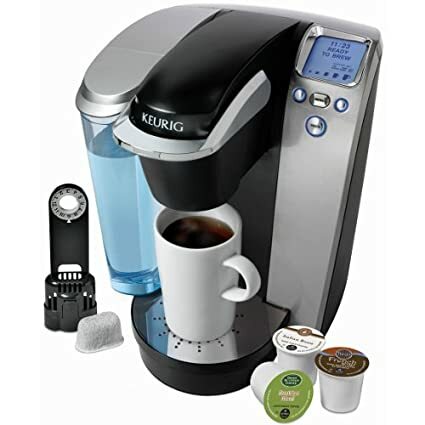 The Keurig K70 and Keurig K75 make brewing your daily cup of black bliss one of the easiest things you’ll do every morning, and clean up is just as simple. It’s no wonder Keurig has become an enormously popular choice since its introduction to the market, and it’s no surprise that the K70 and K75 remain the go-to pick for Keurig fans.